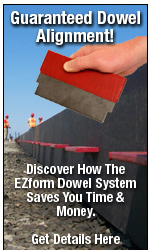 The EZform board is essentially the delivery vehicle for the EZdowel load transfer plate dowel. 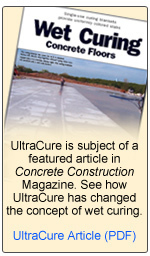 Plate dowel technology is time proven and vastly endorsed by most architects and design engineers as the load transfer dowel of choice for slab-on-grade applications. 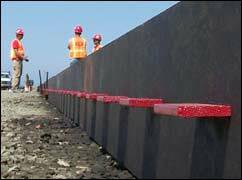 The EZdowel features compressible edge banding for slab lateral movement, and places 20% more steel closer to higher stress areas in the joint as compared to other plate dowels. The EZform board is also shipped at the true dimensional heights specified by the architect’s plan. The EZform System can easily be substituted as an equivalent or equal product to owners, engineers and architects through submittals of our extensive product specification and ease of installation procedures.